Old school charm, modern build quality and an extremely attractive price point - it's almost too good to be true. 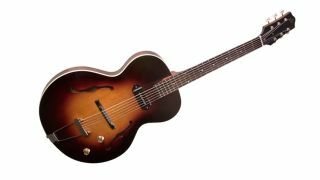 The Loar has unveiled the LH-301T, a thinline semi-acoustic that is sure to raise more than a few eyebrows. Sporting an arched maple top, maple back and sides and a mahogany neck alongside a single P90, it certainly nails the vintage Gibson vibe. Fortunately, for folks unable to stump up for a Gibson ES-125T, The Loar LH-301T is incredibly afforadable at $499, a price that's going to be extremely attractive to players after a modern guitar with a bit of '50s vibe. Interestingly enough, the LH-301T returns this much lusted after style of semi to its entry (ish) level roots. We're willing to be that it's a fairly unruly player what with no centre block and that P90 to contend with, but if it sounds a fraction as good as it looks, The Loar are on to a winner with this one. For more information visit the official The Loar website.